Bean is a smart hub and wearable system for home security. Urmet is an italian and international stakeholder in the production of intercoms and electronical devices for home safety and management. The concept has been presented during a contest called “Smart Telecare Hub” on Desall.com and asked the partecipants to submit a design proposal for a multipurpose hub which main features were the intuitive interface and a contemporary look. Bean is a modern-looking device able to track the status of other Urmet devices like sensors and cameras, send quick SOS and manage emergency calls in case of danger inside the home environment. I took care of the design side as well as the engineering one, both for the hub and the smart wearable necklace. This last has just the SOS function and has been conceived to be worn as a pendant. Urmet aim was to design a new HUB conceived for the safety of the entire family, able to connect to the mobile network and to manage via Wi-Fi several sensors and monitoring devices, to guarantee the safety of the entire home in a discreet and reliable way. The HUB will be installed inside the home environment and will be connected to the telephone network. In case of need, one will be able to send an emerency signal through the alarm button of the HUB or through the remote, that in addition to sending a pre-set alarm message will also start a speakerphone emergency call to the number set by the user during the setup. The main target is senior audience, however the design address the entire family. The design is contemporary, modern and thanks to tactile materials and its rounded geometry the product mantains a friendly and reliable look while being perfectly able to integrate into the home environment. Research focused on technlogical devices in order to point out some key features that the proposal shoul have taken into consideration. My main interest was to deliver a sense of friendlyness and reliabilty that could shorten the gap between an old person and a technological device. The interface was fundamental and making the interactions clear and easy was maybe the most important task. Then I focused on materials. Injection moulding plastic was the technology suggested by the company and fabric was an option that they were open to investigate so I looked back at products from companies like Google and Vifa that during the last years worke a lot on this type of aesthetic. Early sketches and 3D models suggest my interest for a partially angled front face of the product. The idea is to make the interface more visible and perceive the product exactly as if is moving towards you. At some point I wasn’t sure that the toer design was stable enough. In addition it couldn’t fit weel the internal components so I opted for a more lower hard case, trying to play with the fabric cover. BEAN takes his name from the construction curve of the body which resembles in fact a bean. This hub is tiny, compact, and answers all the needs presented by the company. 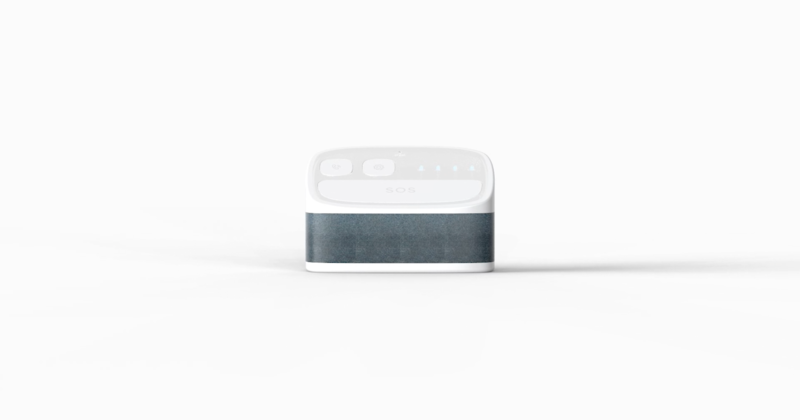 It has a physical interface, made of three large buttons for the main features (SOS, emergency call and settings) and a digital one for side informations such as internet connection, battery status, alert feedback and cloud settings. On the top side of the front side, the microphone is positioned right under a tiny hole but in the best condition for sound capture. On the back side are placed all the ports needed, from Mini USB for charging to a Sim card housing for gathering data and connecting to other wireless devices. Color variations have been chosen considering which one could best fit in almost every home environment and evaluating the brand image of the company itself, which i technological, serious and elegant. During this project I also tryed to imagine the engineerng side of the project, how everything could fit togheter and which could have been the components inside the hub. Even if I’m pretty sure that still needs improvements, I’m also satisfied about the result because involved an effort that helped me grow my overall comprehension of the product itself. For what it concerns the wearable I went for a pendant made by an hard back shell and a soft, silicone front one. This solution prevents from pushing accidentaly the alarm button while keeping the same look and feel of the hub. In the same way I used a lanyard to secure the pendant to the neck, choosing color variations that coul match with the ones of the bigger device.